1. Re-enroll at 4H Online. This means going to 4H Online , signing into your family account, selecting one child at a time, working through the pages and then enrolling each child when finished. - - Click here for a page that will walk you step by step through this process using the parent's email (and password). - - Only youth need to enroll unless the adult is going to be a certified volunteer. 2. Give a hard copy of the Medical Release for every member of your family who will be enrolled in 4-H to the club leader, and to every project leader of projects in which our child is enrolled. Only parents who will be going through the certification process to be an adult volunteer will need to enroll and fill out forms. Under the list of names is a "Member Reports". 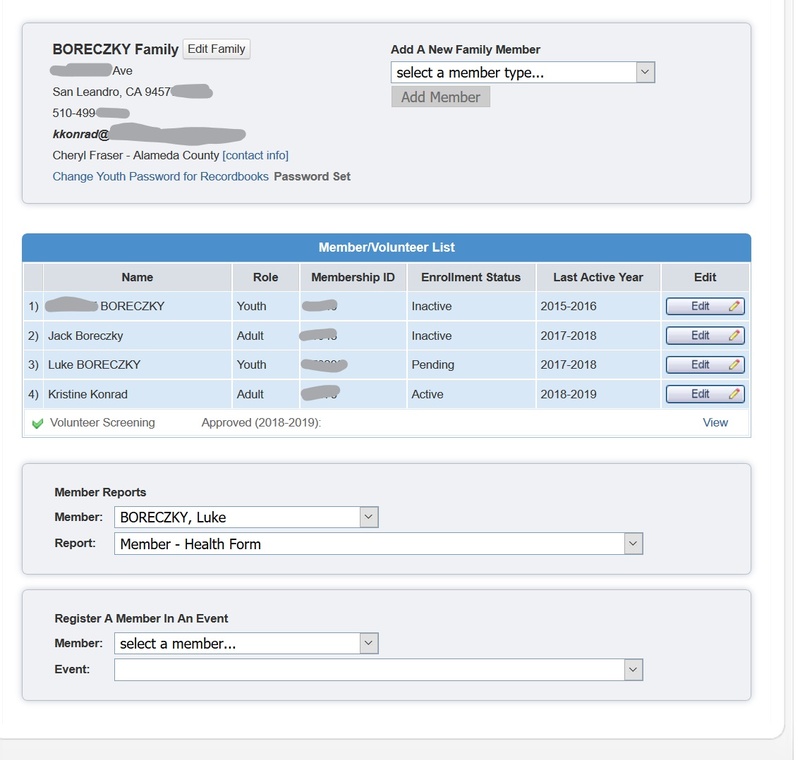 Select the name of the child whose health form you want, and then select "Health Form" in the next line. Give it about 10 seconds, and then you can save or download the PDF. Print out a copy for the club leader (Kris Konrad) and every project your child is enrolled in (give to the project leader at the 1st project meeting). -- You may also find this form at http://4h.ucanr.edu/files/4726.pdf. - - You can bring this to the first club meeting (Sept. 10th, 2018, 1 pm, Creekside Church) or the second club meeting (Oct. 8th, 2018, 1 pm, Creekside Church). If your printer isn't working, you can also email an electronic copy to Kris (I'll print a hard copy out) or even use snail mail (email Kris Konrad for her address, we are between PO Boxes). - - Remember, your club leader needs a copy of the medical form for each member, and your project leaders will also need a copy at the first project meeting. If you have problems with printing from your account, just let Kris know, she will be able to print it for you. 3. I will need a signed Member Agreement for each family. - - You can download the Member Agreement here: 2015_member_agreement_form (PDF) or Member Agreement 2012 (Word). - - Please print it out, read through the Code of Conduct (and discuss with your kids), have everyone sign it, and bring to the September/October club meeting or mail it East Hills if you prefer (email info@EastHills4H.org for address). - - We will also have blank forms already printed out at the Sept. 10th/Oct. 8th club meetings (2018 mtgs, Creekside Church n San Leandro from 1-3 pm), so if you read through the Code of Conduct at home, you can quickly sign a form at the meeting. - - You can view the member’s code of conduct at http://4h.ucanr.edu/files/153602.pdf , the adult volunteer code of conduct at http://4h.ucanr.edu/files/16404.pdf, and the parent code of conduct at http://4h.ucanr.edu/files/187920.pdf. 4. Pay annual dues ($65/youth and $25/adults). - - You can bring the dues to the Sept. 10th meeting or Oct. 8th club meetings, where our treasurer will give you a receipt. You can also mail them to us, using Kris' address (email her for address). - - Cash is fine, but checks are also welcomed. Please make them out to "East Hills 4-H Club". We cannot do PayPal or credit cards, unfortunately. - - We never turn anyone away for inability to pay, please email Kris if you need a fee waiver. What happens after you have enrolled your kids, paid your dues, and handed in the Member's Agreement and Medical Release forms? When the online enrollment is completed and the medical form, dues and member agreement are submitted, you will be confirmed at the club level. After you have been confirmed at the county level, your status will change to Active. I would like all members confirmed and “Active” as soon as possible for insurance purposes. If you aren't confirmed by November 1st, you will not be able to participate in any projects until you are confirmed. Please let me know if you have any questions. I know this can seem a little overwhelming at first, but we are here to help. Welcome to East Hills 4-H!